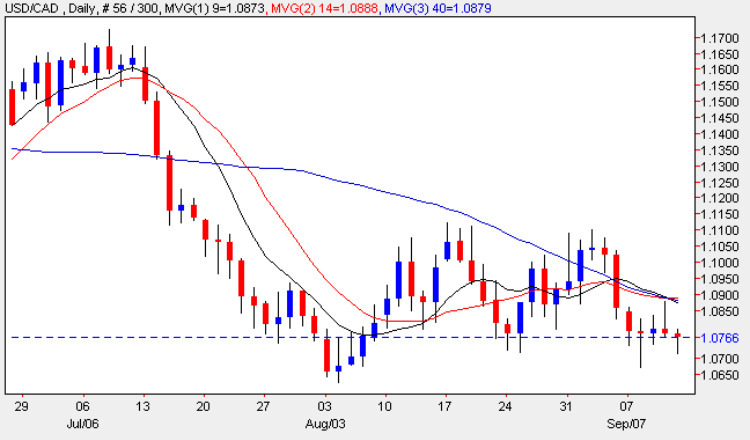 A week of sideways consolidation for the usd to cad forex market, came to an end on Friday with yet another small doji candle, as the currency pair desperately try to rebase in the 1.07 price area, a feature we have seen once again in today’s forex trading session. With all three moving averages now tightly bunched, the significance of these indicators is diluted at present as the pair continue to consolidate in this price region, and as I have outlined in previous posts, we could see some good swing trading opportunities in the next few weeks as the usd to cad pair oscillate between the 1.07 and 1.11 price levels. A break above the upper level would then provide a solid platform to a move higher, whilst a break below the 1.07 level will indicate that we could see a return of the bearish momentum of the last few months, and an approach towards parity once again. With many forex market analysts now suggesting that the US dollar is over sold and due a correction, we need to consider our forex trading strategy very carefully in the next few days, as this could come sooner rather than later with a consequent rally in the usd to cad pair. A thin day of fundamental news on the economic calendar with the only Canadian figures being the Capacity Utilization Rate ( a catchy term!) which is a measure of how efficiently resources are being used in the country. The figures just released came in at 67.4%, down from last month’s 70.2% , but better than the forecast at 65.8% so a mixed picture, but not good news for the Canadian economy, although this indicator tends to have a relatively limited impact on the forex markets. The US markets are dominated by speeches today, with several FOMC members and President Obama all covering the recent financial crisis in one way or another so no doubt the markets will be waiting and watching for any key signals on future monetary or fiscal policy over the next few hours.